Unlike other blockchain-based assets, EOS and its unique Delegated Proof of Stake (DPoS) model use advanced functionality not present in other coins. These features include staking, RAM owned by an account, total CPU resources available, and NET (short for Network) resources. This guide will help bring you up to speed on the features available in the Advanced Drawer of EOS in Exodus. EOS uses an account name in place of a public key. Your account name is your receiving address for transactions and your identity on the EOS network. Your total balance is a combination of your available balance, your staked balance, and EOS that is being refunded (in the process of being unstaked/undelegated - both mean the same thing). Your available balance is the EOS that is available for you to make transactions and exchanges with. Your staked balance is the amount of EOS you need (as resources) to maintain your account, have delegated to someone else to maintain their account, or have delegated for voting (for block producers). A certain amount of your staked balance is temporarily consumed for your actions. This consumed amount of EOS replenishes after 72 hours. When you undelegate or unstake your EOS, you must wait for 72 hours for your EOS to become available for transactions and exchanges again. (Staking is written into the EOS code and not Exodus-specific. Exodus is not holding your funds or preventing you from immediately accessing them. The 72-hour undelegating/unstaking period is a function of the EOS blockchain and cannot be changed). Our friends at EOS Canada have a more in-depth description on staking. You may notice very tiny and unexpected deposits of EOS in your wallet from time to time. These are known as spam transactions and are EOS projects, mostly DApps and ICOs, trying to advertise a message to you. They send an extremely small amount of EOS to grab your attention and will often include an advertising message in the transaction memo. The Hide Small Balances toggle will hide such transactions from displaying in your transaction history. Refund shows you the number of EOS tokens that are being undelegated or unstaked along with a countdown timer, which tells you how long the undelegating or unstaking will take. This section will only be visible when EOS tokens have been undelegated or unstaked. RAM on the EOS network is similar to RAM (used as memory for different applications) in your computer or smartphone and is a limited resource. EOS stores all your account information in RAM. RAM is also used by DApp (short for Decentralized Application) creators to run their programs on the EOS network. Unlike CPU and NET-based resources (discussed below), RAM is a market unto itself. Just like EOS, the price of RAM (priced in EOS) is constantly changing based on supply and demand. All your account data, including your account name, account state, access control information, and airdrops, is stored in RAM on the EOS network’s nodes. This data storage in the EOS network’s RAM is is why you need EOS to create an account. After your account is created, some of your balance is allocated to purchase RAM. A typical RAM allocation starts at about 4000 bytes. As the market for RAM on EOS is freely traded, you may receive more or less EOS back when you undelegate/unstake than the amount of EOS you originally delegated towards RAM. This is different from network or CPU resources, where you are guaranteed the same amount of EOS back after you undelegate. Since RAM is required for certain types of transactions on the EOS network, such as creating EOS accounts, adding EOS tokens to accounts, and more, it's always good to keep some allocated to your wallet in order to ensure that future transactions are fulfilled successfully. RAM on the EOS network is a complex topic - for those who'd like to learn more, consider reading this comprehensive guide. The block producers over at EOS Canada also have a fantastic write-up on this topic. CPU = Processing Time Allocation! The more you have, the more you can do. CPU bandwidth signifies the processing time of an action, measured in microseconds. 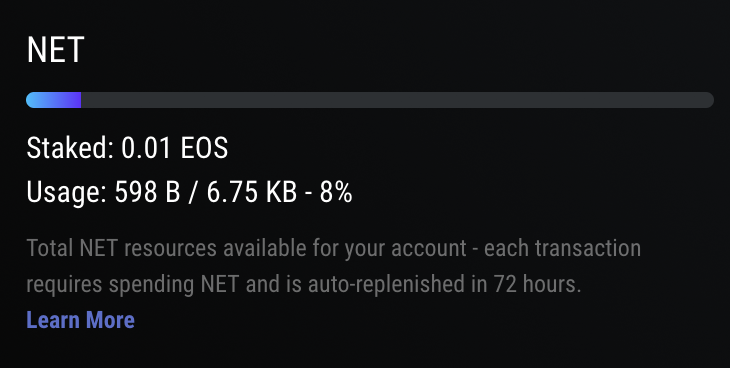 So if you were to make an EOS token transfer from your account to a friend’s account, this action would take some amount of time to complete. This amount of transaction time would come off of your allocation, and then regenerate over time. It's important to remember that for CPU allocations if you stake 10 EOS, you will receive 10 EOS back when you unstake. This is unlike RAM allocations, where you might receive more or less EOS back when you unstake because the value of RAM changes based on market conditions. 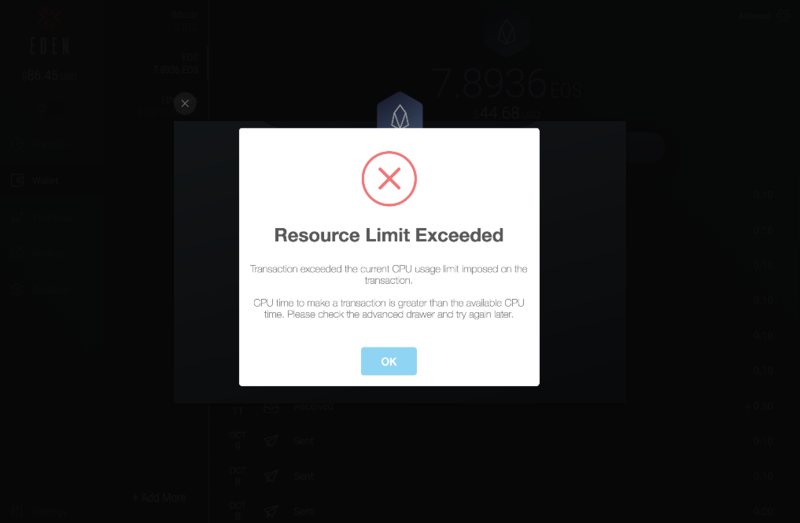 A warning message will appear when your current CPU resources have been depleted either from transactions or because of increased demand on the network. Your CPU resources will be replenished in 72 hours after depletion. NET in Exodus is short for network and represents the amount of resources necessary to execute a transaction. Network bandwidth signifies the throughput capacity of the EOS network, measured in bytes. In the same example as above where you moved EOS tokens to a friend’s account, that transaction would require some of the network’s capacity. Same as with CPU, this transaction data would come off of your allocation, and then regenerate over time. 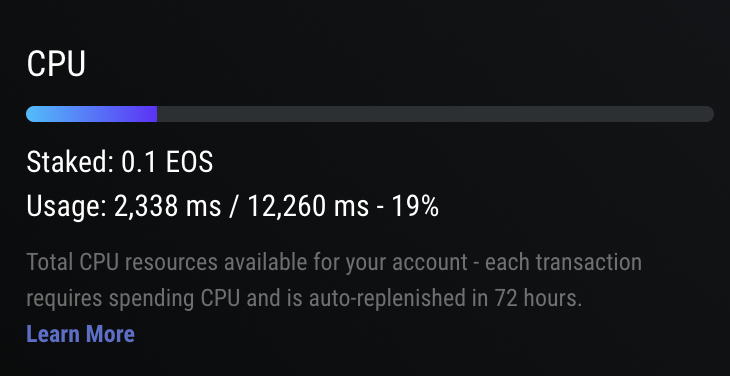 As with CPU allocations, NET allocations allow you to receive the same amount of EOS you staked back when you unstake. For example, staking 10 EOS towards NET will give you 10 EOS back when you unstake. The EOS network uses your staked tokens as payment for resources to maintain your account and its actions. This system is called Delegated Proof of Stake (DPOS) and resource needs fluctuate based on individual account and network conditions. Additionally, EOS is used to purchase RAM for your account as well as vote for Block Producers (BPs) who validate the blocks. The Optimize button is used to unstake all but 5 EOS and optimize your account resources. Exodus allows you to send, receive, and exchange EOS directly from inside the wallet as well as see your account details from the Advanced Drawer. What you cannot do in Exodus is manually manage your stake in the EOS network, vote for block producers, manage delegation of resources, or buy and sell RAM. To manage these advanced features, you will need to use a 3rd-party EOS wallet that offers these features. See our article on how to manage EOS staking and resources for more information.